Therefore, solid height is simply the state of a spring when the coils touch each other and as a result the spring can no longer be deflected. You can put more force on the spring if you want to but the physical height of the spring will not change. A “normal” compression spring has one dead coil on each end. This means that the last coil on each end is intentionally wound to touch the adjacent coil. This is done so that the spring stands straight and does not fall over as it would if it were a cork screw. The first coil is the first side of wire; the second coil is the second side of wire and so on up to the 10th coil. But then the 10th coil touches the adjacent coil and creates an 11th side. Therefore, to calculate solid height accurately you have to multiply 11 into .031 = .341”. Solid height is sometimes used to the advantage of the spring designer. 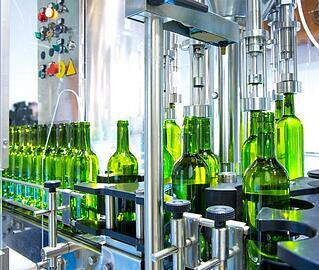 For example, there is often a compression spring at the bottom of a liquid bottle filling machine. If the liquid is something expensive such as whiskey, the designer wants the spring to go solid precisely at the moment the required amount of liquid is present. The mechanism is set such that spring goes solid precisely when the predetermined amount of whiskey is poured into the bottle. The spring going solid is a signal for the machine to shut off and then move the bottle to the next station, making space to bring in an empty bottle. Sometimes the designer may want the spring to go solid at a higher point than on a normal compression spring. When this is the case, the designer will add extra dead coils on each end of the spring. For example, instead of having one dead coil at the end of each spring, the designer may instruct the spring company to put 2 or 3 dead coils on each end of the spring. This builds up the solid height to the desired level. When a spring designer wants a spring that can deflect down—past the solid height of a normal cylindrical compression spring—the designer will frequently design a spring that is cone shaped. By doing that, the spring designer can actually design the spring such that the coils close down inside of each other and the spring can have a solid height of only one wire size. This complicates some of the other design parameters. But if executed well, a perfectly functional spring can be designed with a very low solid height. Solid height is crucial to the quality of your spring, and it ends up being an important parameter since a designer will often design a device that requires a spring. However, in most cases, the spring is the last piece designed and sometimes there isn't enough room in the device to accommodate a well-designed spring. In the event of such an occurrence, more expensive alloys or other design parameters have to be used to attain the desired qualifications. At Hardware Products, you will have access to all our expertise at forming springs of any dimension and complexity, ultimately giving you control of your custom-design compression spring needs. We will assist you in the design of the compression springs to meet your unique specification. It’s as simple as sending us your application. From there on, we enter your parameters into our official SMI spring design program, and follow-up with you, providing our precision recommendation–keeping you always in control of final adjustments and approvals. Contact us—and talk to a real person who will help you with your next custom-designed job.